Holidays – holy days – can be a time for reflection and rejuvenation by taking advantage of the scattered minutes of 'waiting' times in the midst of busy-ness. Standing in line during holiday shopping the few weeks of advent leading to Christmas, hanging decorations, or waiting for cookies and cakes to finish baking are opportunities to quietly reflect on the qualities of kindness, caring and sharing that bring joy to both the giver and receiver – that birth joy in ourselves by their gift of giving. And when you have a bit of time to yourself, here is a sitting meditation on the lasting qualities. Preparation: In a quiet place sit with a straight back, hands folded in lap and close your eyes. Or if you have a holiday candle, just gently gaze at the flame with partially closed eyes. Begin even and regular breathing in a pattern such as this: Count 1 breathe in; count 2 breathe out; count 3 breathe in, and continue counting breaths for at least a minute. This gives your mind something to do, while the even breathing de-stresses your body from the rush of holiday preparations and events. Now, let go of the counting but continue to breathe evenly with no breath retention. In your thoughts take yourself back to a pleasant holiday from your past; maybe from your childhood. Remember the excitement and anticipation you felt. Ask yourself how you could experience that this year. Perhaps giving someone a surprise is one way; I find the planning energizing, and the recipient benefits, too! Take a few moments to appreciate your family and friends, and send out positive thoughts to our world family for peace and harmony. To finish your meditation take a deep breath, stand up and stretch. Advent is a joyous time of looking forward to and preparing in our hearts and hearth for the birth of our dear Babe of Bethlehem. It can be a time of introspection along with all the outer preparations for the joyous celebration. One of the traditions I like is making the special wreath of candles and evergreen boughs as a centerpiece for our table. Then every time I enter the room I am reminded of the coming birth on Christmas morning. Here is a prayer to say each day during Advent either in your meditation or as an evening prayer. If you wish to make this prayer part of your regular meditation begin by sitting in a quiet spot in front of a low table with a holiday candle lit. Burn incense if you like. Will grace us from his love within. That joy and fulfillment come by giving. Who births in our heart every day! Finishing the prayer close your eyes for a period of silence and contemplation on the meaning of Christ's birth to you. Take some time to write out your thoughts in your journal after your meditation for later reflection. Finish your meditation with a deep breath in and out, stretch and go on with your day, enjoying the peaceful feelings that come after the stillness of meditation. Advent is a time of expectation and preparation for the anniversary of the birth of Jesus, the Holy Babe of Bethlehem, that we celebrate on Christmas Day. An advent wreath is a visual way to look forward to the Holy Babe's birth through the symbolism of lighted candles. I find it very inspiring to light the candles in the evening as soon as dusk falls. The act of lighting the candles reminds me that the Light of the world to so many never fades and as the weeks pass in expectation of December 24th and 25th more and more light is produced by more candles being lit. The first Sunday just one candle is lit and each successive Sunday one more is added till all are lit by the 4th Sunday. As there are four Sundays in Advent you will need 4 candles, one for each of the Sundays, and a 5th candle for Christmas Day. Another preparation I make this time of year is the holly wreath for the front door. You can intertwine holly and ivy and pine sprigs on a wreath form or make you own by bending a wire clothes hanger into a round shape and tying on the sprigs securely. 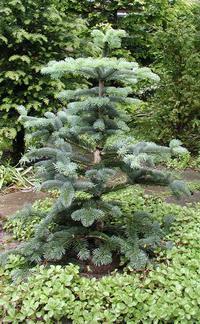 Then adding decorations such as small balls or tiny pine combs, or shiny red ribbons. 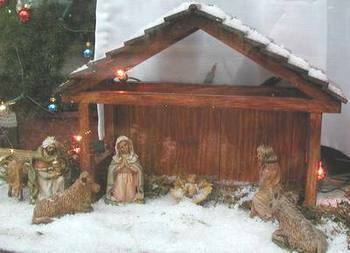 The culmination for me in my preparations is arranging the manger scene in my front window. This holy act really is a special time for me to reflect on the eternal message of Christmas. On November 1st each year we celebrate the lives of saints from the past. I see this as a prelude to the grouping of holy days around the winter solstice from the many world religions and traditions. In the Northern Hemisphere, November it is a time of waning light, a time for more indoor activities of reading and reflection. It is a time of celebration for a bountiful harvest, or a time of quiet and joyful anticipation of a better year to come. Reflecting on the lives of saints shows us the path through life, though it may be materially difficult at times, has a built in reward in that forever in our meditation we can commune with Peace and Joy. In your quiet space, light a candle at your small table or altar and burn incense if you desire. On your seat, sit with your back straight, hands folded in your lap or resting palms up or palms down on your thighs. Close your eyes. Do a few rounds of regular even breathing to calm your body and mind, setting the stage for joy to emerge in your thoughts. Breathe in 2 counts; breathe out 2 counts; breathe in 2 counts and continue. Allowing your counted breaths to continue on their own, turn your thoughts to appreciation for all that you have in life at this moment. Reflect that even when times are difficult with your circumstances or relationships, that you have this precious time in meditation to enjoy your restful body and calm mind. Think of some appreciations. Remember that by their lives the saints have shown that joy is an inner quality that bubbles up to fill in the spaces of each empty-seeming moment with peace and joy, fueling the fires of caring and loving devotion in activities in the world. Finish your meditation with a deep breath in and out; stretch and go on with peace and joy, renewed and rejuvenated as with the lives of saints before and of today. All Saints Day reminds us that there are fine examples of godly souls for us to emulate on our path to God realization. When we read about or meet an enlightened soul in person see that it is possible for each of us to adapt our lives to reach the ultimate human goal. And while we struggle to improve ourselves we have the reflection of saints that point the way. 1. They reached their eternal home of bliss in the past or if still living they may be blissed out now in their consciousness. 2. Saints serve for a much longer period than their human lifetime through the recordings of their lives and deeds that survive their deaths. Begin by sitting up straight in a quiet and private place, either on the floor on a cushion with legs folded in, or on a chair with soles of feet firmly planted on the floor for balance. Fold your hands in your lap or place them palms up or palms down on your thighs. Close your eyes and begin even and measured breathing such as 2 counts to breathe in and 2 counts to breathe out, 2 counts to breathe in, continuing this pattern throughout your meditation without actually saying the numbers. Regular, rhythmic breathing calms the mind and relaxes the body, letting stress dissolve during your meditation and with enough sessions, reducing stress in your life. Follow the flow of your regular breathing for a minute and for this meditation adopt an attitude of respect for the saints. Feel their goodness surround and envelope you during your time of quiet communion. If you are drawn to the life of a particular saint, think about the qualities they embody and that you wish to emulate. Reflect on how you can incorporate these traits in your daily life. Now think on at least one loved one or pet in your life and from that point radiate loving and caring feelings out in ever widening circles in undulating pulses of enlivened energy, aim for encompassing far into the universe. Finish your meditation by taking a deep breath in and slowly releasing it. Open your eyes, stretch out and move on with your day, but first write any new insights in your meditation journal for later review and reflection. The radiance of my soul. The day after Halloween, November 1st, is a time to turn attention to those who have inspired us by their unselfish actions. Here is a prayer for quiet reflection on the lives of saints who've come before us. Take some moments after reading to sit in stillness before going on with your day. I like to pray at the beginning of my meditations for both inspiration and to set a positive mood to the time in silence. Contemplation on the achievements of saints is surely one way to uplift one's mind, and be receptive to the insights meditation has to offer. Come to us as guiding rays. Bless us each in their outreach. Emblazon our hearts from up above. With kindness shown to one and all! We receive the blessings flowing through the saints to us every time we pray for their intercession. So on this special day in their honor we send them blessings, too. Go to your favorite quiet spot to meditate where you will not be disturbed. I prefer the time before retiring as it is very quiet in the household and on the street outside my window. Prepare your altar by laying out a fresh cloth or wiping it clean. Place flowers, a candle, incense, a special rock or other sacred object you find uplifting. Wash yourself and put on fresh clothes to symbolize coming to the altar as a new babe, an innocent. Sit on a cushion with your legs folded in, or sit on a straight back chair with the soles of your feet on the floor for balance. Fold your hands in your lap or place them face up or face down on your thighs. Close your eyes. Begin a pattern of even breathing such as 2 counts to breathe in and 2 counts to breathe out and continue this rhythm throughout the meditation, without actually speaking or mentally saying the counts after the first minute. Take time to appreciate the pathway the saints have taken in their quest to merge with the Divine. Be thankful for their efforts as it has set a beautiful model in our own quest for awareness of Divine Love. Say a prayer such as the one included above this meditation and extend your feelings of love to you family, friends and our global family, too. Sit for a few minutes in silence listening to your breath, then open your eyes and stretch out and go on with your day, uplifted with thoughts of love running through your body, heart and soul. Sit in your favorite meditation spot on a chair or cushion; light your altar candle and burn some incense if you like. Take a deep breath to begin and then go on to breathe in an even rhythmic pattern, such as breathe in counts 1, 2, and breathe out counts 3, 4. Continue breathing evenly while meditating without actually saying the numbers either verbally or mentally. Pick a saintly quality you'd like to emulate during the holidays, perhaps charity. Many saints are known for their charitable ways, and why? Because charity benefits other people, and it also benefits ourselves, because we feel good when giving and caring. Our body feels energized and our mind becomes calm. We feel good about ourselves when being expansive in giving. And, let's remember that charity does begin at home. Give your time and listening ear to members of your own family and then to others in your daily life. If you have the opportunity, spend some time with those shut in, seniors who may not have many visitors. A listening ear may be just what an older person needs more of, especially in the holiday season. That is what charity is: giving unselfishly where there is need. Finish your reflection by writing ideas in your journal about how to be charitable. Or, if you are picking another virtue, write out a plan for implementing it in the coming weeks. Take a deep breath to finish your meditation and go forward with your strong resolves to be part of the plan that makes the world a nicer place to be! All Saints Day is a special time to think on why some people are known as saints. Perhaps with this holy season upon us it is time to pick a virtue that is saintly that we can work on and put to use during the winter season, such as showing kindness so that children or the elderly receive some special tender loving care. Inspire us in your blessed ways. As humans we will be alive. Striving and being fully alive to the Divine within sets the saints a part. They literally shine with acts sublime and divine. This is the kind of life to emulate day by day, little bits adding up to the whole. And the blessed reward coming back moment by moment as happiness and harmony in our lives. Emulating the saints ways is a win – win proposition. Just as with all our acts in life we pull out the direct results of what we put in. What more can we ask? Autumn is a good time of year to reset your meditation altar for the coming holidays. I like to have a candle take center stage so that I can practice candle gazing or tratak at times; particularly in the evening as the day peacefully closes. With the bright deep colors of Fall I choose spice and orange for my Fall Solstice Candle. I like to lay out a mat of multi-colored pressed leaves over my meditation table cloth. They should last through the early winter. And with the new calendar year, January 1st, I choose a white candle to match the crisp newness of winter days, particularly when light is reflected off a new snow. As I live in The Netherlands, I have the opportunity to enjoy several snows through the winter. A big plus about candlelight is it reminds me that warm and caring attitudes nurture relationships. Next, if you like scent, place an incense holder alongside your candle. I like to burn sticks of sandalwood, but that is my personal preference. The wafting smoke of incense reminds me of the transient state of attachment to earthly possessions; yes, they can all go up in smoke at a moment's notice. It is better to meditate on the qualities that are permanent like unconditional love, rather than request objects that will fade away in time. To depict a particular Fall holiday or celebration, such as Thanksgiving, I decorate the altar with flowers, plants or leaves. As Christmas approaches I use a few choice sprigs of holly with berries as I have a few trees in my garden. Perhaps you live in an area where you can bring in leafy branches, or can stop at a flower stand if you choose to. Inspiring photos of saints on your Fall altar can remind you of what you aspire to in your life. I like to keep a photo of Sri Sarada Devi and the Blessed Mother Mary on my altar. And other objects that remind you of the purity of your soul such a crystal stones are a worthy addition to your array. Enjoy creating your Autumn altar; it should inspire your daily meditation. Little meditative prayers for the child in us all! A little prayer of "Thank you, God,"
I thank you, Lord, for this new day. That happiness lives inside me forever! Always teach me what is right. Teach me to speak with kindness and care. Teach me to be willing to share. That all of us are world sisters and brothers. Keep our world family safe in Your sight. I asked, "Lord, please teach me how to pray?" And the Lord said, "Okay." Giving friendship first, and sharing. We shine forth our inner light. Starts shining out on those we love. With a Shining, Loving Light! As a follow up activity after reading these little prayers of thanksgiving with your children, have them draw pictures of each prayer, and collate the pages into a little prayer book for them. The Christmas angel was busy that night. With feathers falling from her wings like gentle snowflakes she laid a trail for the revelers singing hymns of joy house to house along the village lane. Their voices blended harmoniously in the Christmas carols even though they'd never practiced as a group. Christmas carols have a way of uplifting us so that what we sing blends every voice as one in happiness and praise. It is the time of year we can really feel at one with those beyond family to include community. Christmas carolers singing door to door are extending themselves this night of nights and letting barriers down by singing to those they may not even know. The Christmas angel flitted off to her next assignment, another group in another land, traveling faster than the speed of light as angels do by instantly appearing wherever needed in the moment. We too can spread our loving wishes as fast as angel wings by sitting in meditation and sending loving and caring thoughts out to family, friends, the global family and universe. Sit in your favorite quiet place, light a beautiful candle, burn some incense and take a minute for rounds of even breathing to calm and harmonize body and mind. Think with appreciation for what you have and how you can gift those in need this holiday season. By doing with less ourselves we can reap much joy in giving little presents to others. The thing about giving is its blessings return many times over in satisfaction in the form of happiness. Be still for a minute in silence, listening to the sound of your breathing, in and out, in and out. Enjoy the calmness that descends over your body and mind, the gift to you from meditation. May the Christmas angel leave the gift of joy in every flutter of her wings that you come to understand ever deeper the meaning of Christ with us in Christmas. To finish your meditation take a deep breath in and slowly release it. Stretch out and enjoy your deepening peace on Christmas Day. And looking out your window to the horizon, you may just see the fluttering wings of the Christmas angel trailing a dusting of snow. A prayer for meditation to revel in the joy of Christmas. Is by far the truest way. With heavenly light day by day. We go forth, not led astray. Hand and hand with us each day. Living in joy with us today! Christmas lights burning brightly remind us that love is the illumination that stays with us every day, not just Christmas Day. When we spend our moments sharing and caring, our love burns brightly just as the lights of Christmas burn so brilliantly through the holidays. Let the lights of love burn brightly in your life by adopting an attitude of caring in daily activities and interactions. Holding a positive attitude brings more energy into your body. Think about that for a moment. When you suddenly are offered the opportunity to go on a fun outing, no matter how lethargic you're feeling, you'll suddenly feel the energy to get up, get going. Light a candle on your altar. Sit with your back straight, either on a cushion or on a chair. If sitting on a chair plant the soles of your feet firmly on the floor to maintain balance. Fold your hands in your lap or place them palms up or palms down on your thighs. Close your eyes. Begin even and regular breathing such as 2 counts to breathe in; 2 counts to breathe out; 2 counts to breath in and continue this rhythmic pattern throughout your meditation without saying the numbers. Breath is a tie between body and mind; when we need to calm down regular rhythmic breathing helps bring the emotions and body into peace and serenity. Think of an appreciation for someone you love. See your loved one surrounded by the brilliance of Christmas light. Let the light expand outwardly for a few moments into the far distance and over the horizon of your imagination. The light is now encompassing the entire family of humanity in its warmth. Enjoy feeling part of the whole worldwide family. Take a minute to sit and reflect on how you can incorporate the light of love in your life. This is your Christmas gift to yourself that not only benefits you but all the come into contact with you. Finish your Christmas Light Meditation by taking a deep breath and releasing it slowly. Open your eyes and stretch out. Go forward in your day with a positive caring attitude. A lit candle represents the Divine Light that enlightens everyone on our planet. Light is the very sustenance of spiritual and earthly life. When a candle on your altar is lit, as during the Christmas season, the flame provides both heat and warmth, another of the requirements we need on the planet to ward off the chill and in early days, to scare off predators at night. And what is more nostalgic then a blazing campfire promoting camaraderie and the telling of stories and tales? In earlier days, and still in tribal cultures without a written language, it is most likely that many traditions and tales from the culture and history of the tribe are passed down by the younger members listening carefully to the tales of the elders while sitting around the flaming light of a central campfire. Candle light has been with us for a long time in our history and even if we do not 'need' it today because of electric lighting, it adds ambience to any gathering or event. Keep your candles burning brightly and think about some of the ways light and heat have benefited humankind through the centuries. And, why not enjoy the special delights of scented candles, brightly colored as a special centerpiece on altars or holiday tables this year! Ever with us, every way. This is a celebration ceremony for Christmas Day to help make reflection on the birth of the Holy Babe a time for birthing personal and world peace. Your celebration can include elements of meditation, prayer, reflection and music, making it especially festive and meaningful. – A family or living room; in a park; at the beach if in a warm climate. – Family and friends gathered in a circle, sitting on blankets at the beach, chairs indoor. – A central symbol of focus could be a candle that is placed at the center of a table, or a manger scene with candles in a circle. One or more family or friends can lead the ceremony, they need not be clergy – this ceremony recognizes everyone as celebrants. – Christmas carols, of course, and even though this poem is secular, a traditional poem such as "'Twas the Night Before Christmas" which ends with a positive message. – The Christmas story from the Holy Bible with several people taking turns reading sentences. – Offerings of inspiring song or dance from those assembled including the children. – Prepared or extemporaneous speeches on the meaning of Christmas in the speaker's life. – A Christmas Prayer; a time for silent meditation for personal and world peace. – An uplifting Christmas hymn sung as a group with everyone holding hands. Examples that are uplifting: Silent Night, Holy Night; Away in a Manger; Oh, Little Town of Bethlehem; Angels, We Have Heard on High; Oh, Holy Night; your family favorites. Sharing of Christmas treats from the kitchen; exchanging gifts. Give love to others every day. That first and holy Christmas night. Unbridled, full, strong and free. Of the holy Christmas night! A prayer for meditating on the light of love, every day of the year. For Christmas morning's almost here. This precious gift of God's own Son. Where love will live and not depart. Lives safely in our hearts today! As a follow up activity after reading this little prayer with your children, have them draw pictures of the message in each paragraph, and collate the pages into a little prayer book for them. Christmas is an inspiring time – we open our hearts and hands in helping and showing kindness and care. May we take the blessings we receive from family and friends and share it in the larger circle of community, with our family 'round the world. Was born this holy night. To keep each other safe from harm. They're never done for naught. We're sharing the blessings from above. The conclusion of the third week in December marks a time of change. In the Northern Hemisphere going from shorter to lengthening days. And in the Southern Hemisphere the days of light will gradually shorten. But no matter where you live on the planet it is a time of change. Spiritually, the solstice marks an occasion to look at your life as a whole, to evaluate the direction you are walking; where you are heading. And the energy is present to make the changes needed to walk the talk - to step up to the challenges of leading the real life each of us want; a life of happiness. To begin: Go to a quiet place and sit on a cushion on the floor with your legs bent in and hands folded in your lap, or lay your palms face up or face down on your thighs. Alternately, sit up straight in a chair. If you have a meditation altar light the candle and burn some incense if you wish. It is refreshing to have some boughs of pine draped across the front or a living plant or fresh flowers; whatever scents uplift you indulge in. Start a few rounds of regular rhythmic breathing such as counts 1, 2, breathe in; counts 3, 4, breathe out; counts 1, 2, breathe in and continue this pattern for a minute. Then let go the counting but keep up the even rhythm during your meditation. Breath is a tie between the body and mind and helps each part harmonize. When you are stressed begin even, regular breathing as just described to calm your body and mind, both. Now, close your eyes and reflect on the following questions: What is your overall goal in life? Are you heading in that direction by your thoughts and deeds each day? What attitudes can you adopt to help you reach your long-range goals? Are there changes you can make to your daily routine that will aid in making your dreams come true? What is the first step you need to take toward your goal? These are some of the questions to ask yourself and reflect upon to help pinpoint how you can reach the overall goal by the shortest route. I will give you a hint here: Living each moment for what is best for each situation as a whole gives moment to moment happiness. Anything else you do is preparing yourself to make this commitment. To finish your meditation take a deep breath in and slowly release it. Open your eyes and write out your insights and resolutions in your meditation journal. This helps make your uplifting thoughts more concrete and practical in your life. I'd like to leave today by sharing that this is the anniversary of my vow to serve God through serving humanity. Just making the vow brought in a wave of energy to my torso, across my heart region, that has stayed with me ever since. Equal as in the same number of hours of sunlight and dark sounds so close to the word equanimity. Perhaps the message inside the equinox is to be moderate in all things if only on this one day a year, with not too much excess at the very least. The Fall or Autumn Equinox in the Northern Hemisphere is a time of celebration for the gifts of the summer garden. It is a time to both enjoy the plenty, and to store ahead for the leaner days of winter and early spring before new plants are mature enough to eat. As a little aside on winter growing I'd like to suggest making the best use of your east, west and south facing windowsills to grow herbs and salad leaves. I grow them all year in my south facing windows here at the 52nd latitude. Now let's stay in the moment and plan a ceremony, a celebration for the Fall Equinox. Items to include could be vegetables and fruits from the garden or harvest. Use a main candle to represent the light of the sun, which through photosynthesis allows food to grow. Also include a bowl of water to represent the much-needed rain for the thirsty plants. And the universe for the warmth and radiant energy of the sun. As we work to preserve the earth and its natural balance. May we appreciate our global community moment to moment to moment. Be silent for a minute or more. If celebrating as a group, hold hands in a circle surrounding the altar during this short period of reflection. While holding hands in the circle, each in turn can give an appreciation for what they have to be thankful for and their plans for the coming autumn season, which may include making gifts for giving during the winter holidays. Ask everyone to sit down and finish your celebration with quiet time in a peaceful meditation for several minutes, followed by a joyful song of thanksgiving. After your celebration eating a shared meal is a good way to socialize before leaving – a feeling of fellowship embracing all. The signposts of changing seasons mark opportunities to meditate and reflect on what is important to us. Autumn is harvest time in the Northern Hemisphere, and a time to reflect on what we have reaped in our lives through our actions. To begin a harvest meditation sit straight, eyes closed, hands in lap and take a few even breaths to settle down. For example - breathe in 2 counts; breathe out 2 counts; breathe in 2 counts and continue. Begin thinking with appreciation on what you have harvested in your life. If you have a long-range goal, break it into manageable pieces - little steps to success. Reflect that each positive step leads to another in kind, and builds a life full of contentment and happiness. And what greater reward could anyone reap in the harvest of life, then being able to see a bounty of harmony and peace! Reflect that we are all interrelated and by helping one another attain goals by giving encouragement we are adding to the overall world success. The equinox is a time of even hours of night in day in both hemispheres. Let's take advantage of the time where we on the planet all have this in common to dwell on our sameness as one large family of humanity. The fall or autumnal equinox marks equal hours of light and darkness, but particularly it is a time for appreciating and giving thanks for the fruits of our gardens and labors in life – at home, school or work. Here is a plan for an equinox celebration for a group of people to hold outdoors - at the beach, park, in the mountains, or another space big enough wherever you live. 1. A central focal point is established. It could be a bon fire or table of offerings from the summer’s harvest of fruits, flowers or vegetables placed in the center of a large circle. 2. To begin, everyone gathers round the central focal point in a circle and holds hands. See You shining as a sun. Keep us sheltered in Thy sight. We feel Your presence in our time. Call out our need and daily pray. Lord, keep us centered, one and all. Keep us striving toward the light. 4. After the prayer follows a minute of silence for contemplation on the meaning of the equinox as a point in time signaling spiritual balance. 5. The silence flows into uplifting group singing or peace chants. If the group knows a simple circle dance that could come next. 6. At the end of singing and dancing everyone sits down in place for a few minutes of silent meditation on the theme of thankfulness for the season’s harvest. 7. Rounding out the ceremony, all rise, join hands and sing an uplifting song for world peace and harmony. Fall is the time of year we have to rest from summer activities. If you live in the northern hemisphere the days are shorter and evening more conducive to indoor activity, in particular I’m thinking of catching up on reading all those recommendations from friends. To make use of concentrated reading it is the time to dip into your stash of spiritual books or those that carry a strong moral, reading about others’ experiences of what to avoid, especially. And, in this way learn how to live rightly. Begin by preparing a spot where you can sit privately and undisturbed. If you use an altar set out a centerpiece of the changing leaves, and light an orange or yellow candle. Burn some incense, I like sandalwood. Then fold your hands in your lap or place them palms up or palms down on your thighs. Close your eyes and begin even and regular breathing such as one count to breathe in and one count to breathe out. Do not hold your breath at any time. Regulated natural breathing is a way to calm an agitated body or upset mind, it moderates your emotions. After a minute, let go of counting your breaths, but keep up the rhythmic pattern throughout your meditation. Imagine you are walking along a well-worn path through an old forest. Pine needles underfoot cushion and quiet your steps until all you hear are birds singing in the top of trees. The bird songs are harmonious to your ears and you feel at peace and at one with nature. Occasionally a flutter of leaves gently float by to rest on the floor of winter to come, but for now forming a carpet of color all around. When the chlorophyll leaves the leaves and retracts into the tree the real inner color of the leaves is revealed, just as our inner brightness is revealed when we let it shine through caring and compassionate acts. Along this path nature is leading the way in teaching us how to harmonize our lives both outer and inner: Outer through physical activity and inner through meditation and reflection. Now the path is opening to a meadow where you have a chance to sit and rest, feeling the sun’s warmth, just as we feel warmth through our sunny acts in the world. Enjoy these feelings before gently opening your eyes, taking a long breath in and slowly releasing it. Stretch out and go forth with renewed vigor, a bright attitude, a loving heart. All Saints Day is celebrated on November 1st each year, and is our special time to remember those who have come before us and dedicated their lives for the betterment of others. Serving the needs of others has its own reward of joy in the very moment of action, because the doer feels harmonious. The reward for acting for the highest good is an option all of us can grab onto at every moment. And if we are not doing so now and wish happiness and harmony for ourselves, now is the time to change our views, attitudes and actions. Because I have been through the experience I can tell you first hand that instantly your body will relax and mind become calm. This happened to me more than 30 years ago and my life changed for the better from that moment on. It is a personal decision to go for harmony, thereby bringing happiness into your life and acting as a catalyst for others to follow suit. To begin, first arrange your meditation altar if you use one with a nice center or side candles, incense, fresh flowers. Wash and put on fresh clothes. Sit on a cushion on the floor facing your altar, fold your legs in. Alternately, sit up straight in a chair with the soles of your feet firmly planted on the floor. Clasp your hands in your lap or place them palms up or palms down on your thighs. Close your eyes and begin regular, even breathing for a minute, such as 2 counts to breathe in; 2 counts to breathe out; 2 counts to breathe in and continue the rhythm during the meditation, but let go of counting the numbers. Breath is a bridge between body and mind and regular even breathing calms the mind and relaxes the body. Now take a minute to think of an appreciation for someone in your life who has inspired you to be your best. Think on what qualities that person had that struck a chord with you. Those would be traits to emulate. Take some time to think of a specific saint who has inspired you; reflect on their qualities and how you can incorporate them into your own life. Finish your meditation by taking a deep breath in and slowly releasing it. Open your eyes and write any new insights in your meditation journal. Stand, stretch and go on with your day with appreciation for the saints who have come before and modeled the highest way to live. This is one of my favorite times of year because I have time to reflect and meditate on all I have to be thankful for. Probably I really get into the Christmas spirit beginning with Thanksgiving Day, when we are given the opportunity to express all our blessings, usually around a feast with family and friends. Begin with a medium round pizza pan or other round fireproof plate or pan of similar size, about 12 to 14 inches in diameter. Stand thick candles toward the outer rim, evenly spaced a part. I use thick candles so they don't burn down too quickly. I like to use red candles, but you could use a different color for each week leading to Christmas, or choose those with different decorations to make each week special. 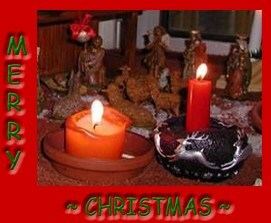 Now, place a special candle in the center to be lit late on Christmas Eve or first thing on Christmas Day. I like to use a white candle with gold or silver decorations. To me that is very special. At the base of the candles lay pieces of evergreens in a circlet pattern with the fronds overlaying the stems of each piece as you lay it in place. 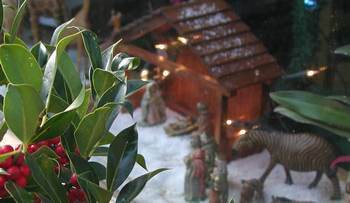 You could use holly with berries interspersed with pine. I also like to place small figures of animals, such as sheep or cows amongst the foliage before moving them to my manger scene at Christmas. To use the constructed wreath, either place it on your meditation altar or on your mantle or dining table, where ever it seems appropriate in your home. Also scale down the diameter of the pan or plate holding the wreath items if you have a smaller space to place it. Be sure that when the candles are lit they are not near anything flammable like a tablecloth below or objects at the side or overhead like a hanging lamp. This Christmas season I wish you many blessings and an opening in your awareness of the real meaning of Christmass. Let’s take a few moments for silence and appreciation for all we have in our lives, because those who came before us fought hard that we may live in an independent country. Here is a prayer to include in your meditation on the 4th of July . That it never falls apart. Of honor and ‘In God We Trust’. Never forgotten - never a lapse. Americans – join hand in hand! Independence Day, in America the 4th of July, is a time to reflect on the sacrifices we have made and make to be able to express ourselves without suffering negative outcomes. But, it is important to remember that one's expression cannot be another's repression. This is just one point to reflect upon on Independence Day. 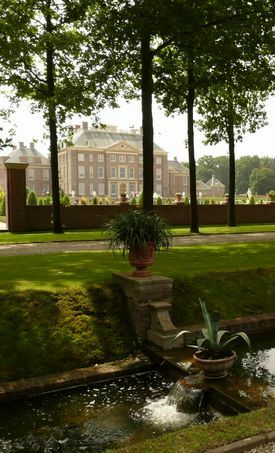 Begin by sitting in your favorite spot or in a quiet place in the garden. If you are sitting on the floor on a mat fold your legs in and clasp your hands in your lap or place your hands palms up or palms down on your thighs. If you are sitting in a chair, sit up straight and place the soles of your feet firmly on the floor. Fold your hands in your lap or place them palms up or palms down on your thighs. Close your eyes and begin regulated breathing without stress or force, such as breathe in on count 1; breathe out on count 2; breathe in on count 1; breathe out on count 2, and continue in this pattern during your meditation without actually saying the numbers. Do not hold your breath at any point. Breath is a connective force between body and mind; even and regulated breathing calms a restless mind and relaxes an agitated body. Use it any time you need to calm yourself. Freedom and independence are precious. Now is a good time to think on what these ideas mean to you. Let your thoughts develop, one thought leading to a deeper thought, like peeling the layers of an onion, layer upon layer. In this way you gain depth of understanding on the importance of independence, and independent thinking in your life. We each have a unique gift to develop and share with the world. Independent thinking can help you discover yours. Finish your reflective meditation by taking in a deep breath and slowly releasing it. Open your eyes and write new insights in your meditation journal. Occasionally, go back and review your thoughts. Every year on the 4th of July we have the wonderful opportunity to celebrate our freedom. Let's remember in our prayers and meditations to be grateful and thankful for all we have. Where freedom's concerned - not complain. We give our heartfelt thanks. Working together hand in hand. We give our heartfelt thanks! And try to do our best. The blessings on this Labor Day. Begin by finding a quiet spot to sit on a cushion on the floor with your legs folded in. Alternately, sit on a straight-back chair, with the soles of your feet on the floor for balance. Fold your hands in your lap or place them palms up or palms down on your thighs. Close your eyes. Begin even regular breathing such as 2 counts to breathe in and 2 counts to breathe out. Keep up this pattern throughout your meditation. Take time to think on all the family and friends you have, your coworkers and all that you are truly grateful for. Everyone is part of your immediate family or your global family. Think on this: We depend on each other to do the best at work so we all benefit. After all, we give our hours at work for others' benefit and they do the same for us, as we are all sharing and using the natural resources. Take a deep breath in and slowly release it while giving an appreciation for this day of rest. Open your eyes, stretch out and go on to enjoy your day. May we reflect lightheartedly and prayerfully on this day of celebration by sitting in meditation and reflecting on the following verses! We celebrate on Labor Day. We each deserve a little rest. Work well done an unspoken song. Even when work seems more like strife. Our talents perhaps, but surely to grow. Helps us remember we’re an important cog. "A good job we've done." Labor Day is dedicated to rest, relaxation and celebrating all the effort we put into work. To begin, pick a familiar trail so you needn't worry about where your next step may lead, while reflecting inwardly on the benefits received in your life by giving "your all" to work. Set out in an even rhythm such as taking 2 steps to breathe in and 2 steps to breathe out. Let your arms swing at your sides - right arm and left leg forward, then left arm and right leg forward. This practice develops right-left brain synchronicity. Walking along in stride let your thoughts turn to appreciation for all gained in life by your labors, such as the essentials of life for yourself and family, and the companionship of coworkers and colleagues. Appreciation lifts the spirits, and combined with a walking meditation – sets the stage for peace and harmony at home and work. Let us honor the lives of saints who've tread the path we are now on, by remembering them on November 1st. I see this as a time to remember there are others who came before us and through sticking with one or more virtues elevated themselves into an eternal blessed consciousness. Remember that by their lives the saints have shown that joy is a quality that bubbles up to fill in the spaces of each moment with peace and contentment, fueling the fires of caring and loving devotion with family, friends, the community of the world. We have the choice ourselves today. That we'll learn to pray. Pray for us till we come home. Till we justly return home. With loving kindness in our heart. She was sitting on a window seat gazing out on the snow that had fallen during the night. The angel was disguised in the garb of an elder, obvious from her flowing silver-streaked locks and relaxed bent posture. She had been through and seen so much during her many days; knew it would not be long before her tresses and skin matched the blanketing drifts outside. But in the meantime she was using these moments of reflection to think back on what she had done with her life. Had she used it wisely? Had she done all that she had come for? Deeper and deeper her memory searched back and looked at events where she had an opportunity to help others, especially children in life and death circumstances. There had been several children she'd pulled from the clutches of death who would have drowned. Two youngsters had fallen into swimming pools and she was the one who saw them at the bottom, and without a second thought had jumped in and pulled them out, almost as if they had never fallen in. And then there was the time a boy of 11 had drifted out on the early winter's ocean surf on a child's raft. Because his legs had become cold with hypothermia he could not kick to get himself back to shore. She had run into the breaking waves with more will than strength, while calling to others to help drag him to safety. Now that she was too tired to run on the beach her acts of selfless love had taken a new turn. While she would sit at her computer she would go deeply within and dream up stories and meditations to help others fulfill their mission on earth of developing beautiful souls, by using opportunities as they arose to contribute to a better world for all. Particularly, she wrote on how parents could guide children to be the best they could grow to be. She shared hints she'd learned along the way, with the intent of instilling spirituality in hearts and minds through simple kindness. And as parents would be teaching, so they too would get ideas on how to actively care. Was the mission of the Christmas angel accomplished? I'd say it was, as this morning when glancing over at the window seat I saw the reflection of where she had been as a glowing light, stretching outside, shimmering on the snow, rising above the trees and beyond the horizon. And the memory came to mind this Christmas morning that Christ's message lives eternally: Expend energy lovingly with each other, as He loves each of us heart in Heart. Is there any better way that a Christmas angel would live? I have received in my life. for the comfort of my friends. be taken from me – Infinite Lovingness. the direction of my conscience. letting myself rise within Your uplifting presence. with all my body, mind, heart, soul, spirit. Thanksgiving Day comes by once a year so let's make the most by offering sincere thanks for all that we have. Here is a prayer to get you started and perhaps include as your circle of family or friends gather for a holiday meal. In my family when the kids were growing up we took time to hold hands around the table, and each take turns saying one appreciation for the person seated to our right. Then the head of the table said a prayer of thanksgiving. For our family, friends and neighbors, too. And as much as we can, to be of use. To give our time and helping hands. To provide for much as we truly can. And gas to run our cars. Others will find their way this year. We are thankful and grateful this year! This is a special holiday to really reflect on all we have to be grateful for and not to dwell on the shortcomings. Thanksgiving Day is a time to show care and share with family, friends or those less fortunate by donating groceries or serving at a shelter. Thanksgiving is a time to extend our borders of self to consider that we are part of the large family of humanity. Reflecting on our interwoven lives feels satisfying, because we start feeling our interconnection with others. We can extend the Thanksgiving Day feeling by smiling as we walk down the street and with those we interrelate with during the day. For example, I know the grocery store checkers feel the warmth of a smile. I've observed how they relate to kind and cranky customers, and it's different. To begin: choose a quiet place, and if you have a meditation altar it would be appropriate to light an orange or yellow candle for it cheeriness. Burn some incense if you like and set out a plant or flowers. Facing your altar, sit on a cushion on the floor with your legs folded in and back held straight. Or, sit on a chair with your back held straight and your hands clasped in your lap or palms facing up or down on your thighs. Close your eyes and begin breathing evenly, such as one count to breathe in; one count to breathe out; one count to breathe in; and continue this pattern for a minute. Then, let go of the counting but keep up the rhythm for the rest of the meditation. Now, think of at least two things you are grateful for, thankful for in your life. You could include family, your job, your health. Reflect on how you can add to someone else's joy by being kind during your regular day. Take some time to send caring thoughts out to your family, friends, community, world, universe. Allow yourself to feel expansive while feeling part of the larger whole. Finish your meditation by taking a deep breath in and slowly releasing it. Stand and stretch and go on with your day, feeling whole and refreshed. If you keep a meditation journal now is the time to write any new insights that came to you during the meditation. Later you can go back and review them. And share Your love wherever I go. We have this special day each year to concentrate on the blessings that flow through our lives. And we return those blessings to family, friends and larger community by kind thoughts and acts. Even keeping a positive attitude blesses others as the feeling is picked up by those crossing our path each day. Let’s use Thanksgiving Day as a starting point to show we really are grateful for nature’s bounty by conserving our resources for now and future generations. Isn’t it our responsibility as earth’s stewards to keep what we have in good shape and flourishing for all? I’ll do my best to conserve natural resources. I’ll be kind each step along the way. And contemplate how these treasures can be spread. That I may always be thankful for what I am given. Decorate your altar for the holiday, perhaps with an orange, golden yellow or cranberry candle. Burn your favorite incense. Sit up straight and close your eyes and begin even and regular breathing in a measured pattern such as one count to breathe in, one count to breathe out, one count to breathe in, and continuing on with this pattern during your meditation. After establishing your rhythmic breathing, let go of the counting and continue the pattern throughout your meditation. Contemplate the meaning of Thanksgiving Day in your life. Is this an opportunity to be with family and friends in appreciation for this group of people in your life? How can you show others you care about them? When you feel thankful how does your energy level change? Do you feel inspired and energized? Take a moment to give an appreciation for the bounty of your family and friends in addition to your special meal. To finish your meditation take a deep breath in and slowly release it. Open your eyes and write down any new insights in your meditation journal. Stretch out and enthusiastically go on with your day. Thanksgiving Day comes once a year, but if we turn our thoughts to thankfulness every day we reap the rewards of contentment and blessedness year round. Lets us feel well, live completely. A tradition my family has enjoyed on Thanksgiving Day is holding hands at the table before our meal and going around the table with each of us saying what we are thankful for. Even the little ones participate. Then we have the more formal meal prayer. We like to set the table to reflect the meaning of the day with a centerpiece of candles and colored fallen leaves. I like to use gold and orange candles for the Thanksgiving centerpiece surrounded by oranges stuck with cloves. Before we begin the meal I heat apple juice or cider with a cinnamon stick to remind us that thanksgiving, daily, is the spice of life. Thanksgiving and appreciation are qualities that warm our hearts and fill us with energy to think and act kindly. What better way is there for us to live in our world than by spreading kindness and joy wherever we are. Preserve it we must for more than a few. We give our thanks dear Creator, to You. Incorporate this meditation and prayer into the time you sit around the table to enjoy a bountiful meal with family or friends. Prepare the table by laying out a cloth and making a center piece with a large candle surrounded by autumn vegetables, fruit or flowers. When it's time for dinner let your guests know you are going to incorporate a Thanksgiving prayer and a period for silent meditation at the end of the meal. I suggest you wait until everyone has eaten so the food does not get cold, then hold hands for the prayer, such as the one above. Next, go around the table and let each one give an appreciation for what they especially are thankful for. Then spend a minute in silent meditation before unclasping hands. Now, it's time for dessert and that can truly be a time to warmly share amongst family and friends. Events like this help spiritualize the bond between family and friends and remind us we are not a lone island on planet earth, but rather interwoven into each others' lives on the local and global scale. Let thoughts of thankfulness, gratefulness extend from your holiday celebration into life by caring and sharing what comes your way for the good of family, friends, community. As hours of daylight wane, and we spend more time indoors, here is a passage for thanksgiving and meditation on the power of our 'inner light' to shine for world peace. Never underestimate the power of prayer, intention, meditation for uplifting all minds. After day is done, our time on earth completed we will see that divisions keeping us in the delusion of separateness will have melted away and we will be of one mind in the greater One mind. Let us give thanks during the holidays this year for all we've come into consciousness of as one humanity. With caring actions day and night. Open us to 'inner light'. Our constant song let that become. Knows our need and knows it's right. Giving all a firm release. From darkness by pure love's unfolding. Let's go for peace keeping. And flourish fully – work well done! And safe they'd ever be. From taking up the cause. For freedom, that there'll be release. For all you gave and give! Let's take the opportunity to commune in a meditation with nature. We can let the natural sounds be part of the rhythmic pulse of our meditation just like we listen to the regular pattern of our breathing. To begin, go for a walk to a secluded area where you will not be disturbed for half an hour or more. It can even be a meditation bench at the back of your yard if you have the privacy. Another choice is a public park such as the Santa Barbara rose garden in the photo. If you sit with your hands folded in your lap and eyes closed, those passing by will think you are resting and not wide awake behind your shut eyes. If you have a beach nearby sit at water's edge but not so near that a wave will overtake you. Ideally, you've brought a beach towel or blanket along to sit on. Meditating outdoors requires a little more preparation than staying in the house: include a sun hat, sunscreen, sweater or light jacket, towel or light blanket, water bottle, insect repellant, fruit or granola bar. 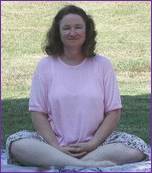 For the meditation, if you are sitting on a blanket on the ground bend your legs in and fold your hands in your lap. If you are sitting on a bench plant your feet firmly on the ground to maintain your balance. Fold your hands in your lap or place them palms up or palms down on your thighs. Either way of sitting close your eyes. Take a deep breath in and slowly release it. Begin even regular breathing one count to breathe in; one count to breathe out; continue this pattern throughout your meditation. When you breathing is established listen to the sounds of nature around you. Do you hear birds in the distance. Listen to the rhythm of their songs. It is so much like human poetry or song in its repetitions. This rhythm is soothing to the soul. Paying attention to a bird song takes us on a mini-vacation away from cares of this world into a land of harmony. It is this natural harmony we are looking to capture and take with us after the period of meditation. When you are ready to end your meditation take another deep breath in and let it out slowly. Stand and stretch and walk home feeling the harmony of nature all the way down to your bones. Coming home, if you've had any new insights during the meditation write them in your journal for future contemplation and review. By taking time to regularly reflect, meditate, seek guidance from the quiet within, we can work out many of the problems we face in the active part of our day. Winter in the Northern Hemisphere with its longer hours indoors is a time for deeper reflection and meditation on long-range goals. Choose a quiet place reserved for meditation; a corner of a room, even a closet can be converted to make space. 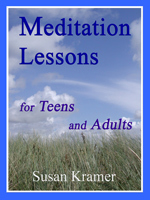 Sit on a cushion or chair with your back held straight, hands folded in lap, eyes closed. Sitting before a low table with candle, burning incense and flowers is conducive to peace. Begin even breathing: Counts 1, 2 breathe in; counts 3, 4 breathe out; counts 5, 6 breathe in; to 50 or another even number. Stop counting and just continue to breathe evenly. Reflect on the day's events. Decide what to do about a situation that is unresolved. Re-evaluate your goals, if necessary. Plan the next day's actions to harmonize with the best for all concerned, preserving personal peace of mind in the process. Keep a journal at your side and reflect on long-range goals. In subsequent meditations note your progress. Also, a journal used in this way becomes a valuable tool for recording issues you are going through at the time. Writing is one way to work out sticky problems in an objective rather than emotional way. Finish the meditation with prayers or affirmations for personal and world peace. Stand up and stretch, refreshed. Solstice is a time for reflecting that all life on earth is cyclical. It is another opportunity to give your prayer and meditation life a regular cycle of its own. By taking time to regularly reflect, meditate, seek guidance from the quiet within, we can work out many of the problems we face in the active part of our day. Choose a quiet place reserved for meditation; a corner of a room, even a closet can be converted to make space. Sit on a cushion or chair with your back held straight, hands folded in lap, eyes closed. A peaceful world home for everyone. Stop counting and just continue to breathe evenly. Reflect on the day's events. Decide what to do about a situation that is unresolved. Re-evaluate your goals, if necessary. Plan the next day's actions to harmonize with the best for all concerned, preserving personal peace of mind in the process. 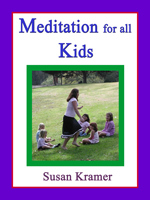 Finish the meditation with prayers or affirmations for personal and world peace. Stand up and stretch. Planetary peace more easily gained.